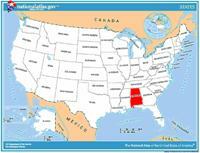 ﻿ Fun Easy English - Travel the United States of America - Alabama. Learn before you travel. This section of Fun Easy English focuses on facts and other cool stuff about your favorite U.S. state. This is great English reading practice. This page focuses on the state of Alabama. Alabama's state flag is simply a crimson cross on a field of white. 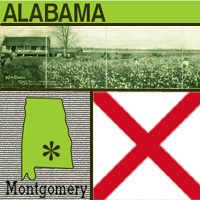 The Alabama legislation does not specify whether the flag should be square or rectangular (only that the bars be at least 6 inches broad), and it is seen both ways. Flag of Alabama I salute thee. my service, and my life. Origin of Name Means "tribal town" in Creek Indian language. Travel and tourism site for Alabama - This state travel and territorial tourism site provides ideas for your vacations, meetings, and more. Each May in the courtroom and on the lawn of the Old Monroe County Courthouse, actors put on a production of the Pulitzer Prize-winning novel To Kill a Mockingbird. Now a museum, the courthouse in Monroe County, southwestern Alabama, has been called "one of the handsomest and most conveniently appointed [courthouses] in the state." To Kill a Mockingbird is a story about a man who is accused of a crime he didn't commit. The author of the book, Harper Lee, was born in 1926 and she grew up with the old courthouse as the center of all activity on the town square. It's easy to imagine how the elegant courtroom of the old courthouse may have inspired parts of her book. 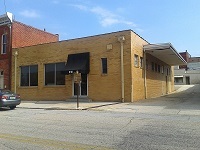 When the book was made into a movie, it is said that Lee insisted that the director of the film visit the Old Monroe County Courthouse before constructing the movie sets. The star of the movie, actor Gregory Peck, also came to see the courthouse and town. He later said that the role of Atticus Finch, who is the accused man's lawyer, was his favorite of all time. The caves have a long history. The earliest inhabitant was Archaic man (Archaic Period, 8,000 to 1,000 B.C. ), a cave-dweller who lived on small game, fish and nuts. During the 1500s it was explored by the Spanish. 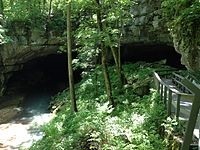 In 1796, Benjamin Hawkins, a U.S. agent appointed by George Washington, wrote about the magnificent beauty of the DeSoto Caverns in a report, making it the first officially reported cave in the United States. During the Civil War, the DeSoto Caverns became a site for mining saltpeter, used in making gunpowder for the Confederate Army. The following is a description of national forests and monuments in the state of Alabama. There are no national parks in this state. If you plan to visit or live in Alabama for awhile then you should definitely plan to visit some of these fantastic places. Tuskegee National Forest's Bartram National Recreation Trail was Alabama's first National Recreation Trail. Tuskegee is one of the smallest National Forests and is managed together with Alabama's other National Forests. This forest contains 153 mi (246 km) of trails and the Sipsey Wilderness, which at 24,922 acres (10,086 ha) is the largest wilderness area east of the Mississippi River. It is managed together with Alabama's other National Forests. Preserves the A. G. Gaston Motel, a historic site related to the civil rights movement in Birmingham, Alabama. Preserves two sites related to the Freedom Riders in and near Anniston, Alabama during the civil rights movement—a former Greyhound bus station in the town and the site of a bus burning incident outside town. Donated by the National Geographic Society, the cave's exceptionally large main entrance was used as a shelter by prehistoric Indians from the earliest known human settlement in the southeastern United States. The rock from which Russell Cave was formed over 300 million years ago at the bottom of an inland sea that covered the region.